DES MOINES - The Iowa Barnstormers of the Arena Football League announced today that the single-game tickets for the 2014 regular season will officially go on sale to the public on Wednesday, March 5, 2014 at 10:00a.m. CT. Fans may purchase Iowa Barnstormers single-game tickets online at www.dahlstickets.com or at the Wells Fargo Arena Box Office located at Wells Fargo Arena in downtown Des Moines. The Box Office is open Monday though Friday from 10:00 a.m. to 5:30 p.m. and Saturday from 10:00 a.m. to 2:00 p.m. Fans may also purchase tickets by stopping in to the Barnstormers office, also located in Wells Fargo Arena. 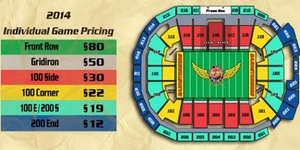 Individual Iowa Barnstormers game tickets will be priced from $12.00 to $80.00 for regular season games. Fans should also remember that 2014 Barnstormers season tickets are currently on sale. Season tickets to all 10 home games, which includes the first home playoff game, are available for as low as $110 per seat. Group ticket packages are available for groups of 15 or more. For more information about ticket options, please call the Barnstormers at (515) 633-2255, or log onto www.theiowabarnstormers.com. The Barnstormers will host the San Antonio Talons in thier 2014 home opener on Saturday, April 12, 2014 at 7:05 p.m. Individual ticket details may be found above.